The truck transport by water is among the most efficient, most cost-effective however often also the quickest transport routes. Carriers save costs for fuels, toll charges and additionally minimise the burden on the vehicle and the environment. In order to offer the customers of our business partners a comprehensive range of ferry services, we cooperate with the PIQUE Ferry Agency. You benefit from the access of our exclusive partner to all relevant ferry connections and central tunnel passages in Europe and North Africa. Take advantage of the comfortable and secure booking service and an emergency on-call service, which is available to you on seven days a week 24 hours a day. The offer is currently accessible for the end customers of Aral/BP as well as Circle K.
Especially for the Spanish, Italian and Greek region we moreover cooperate closely with the Grimaldi Group, which offers a large selection of maritime routes for trucks on Ro/Ro ferries. The reservation of a place is carried out without any complications by the carrier or driver directly through the ferry operator. 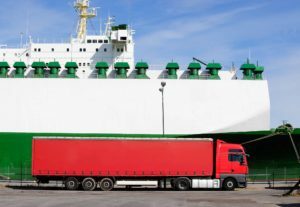 An e-mail is sufficient for this purpose with the details of the departure port as well as the details regarding the vehicle or the cargo. You can receive further information via the On Road Services Web Portal or through our customer service. Roll-on/Roll-off ferries make it possible to roll trucks on their own axis onto ships and onto land again. The driver can ship the cargo transport with his truck and the trailer or only the cargo or the trailer – without travelling with it.